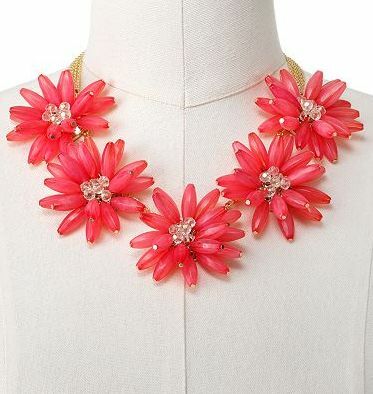 J Crew’s beaded rose necklace ($128) is sold out. So of course now you really want it. I know, me too. However, if I look at the scale of the flowers, it’s probably not a match for me. 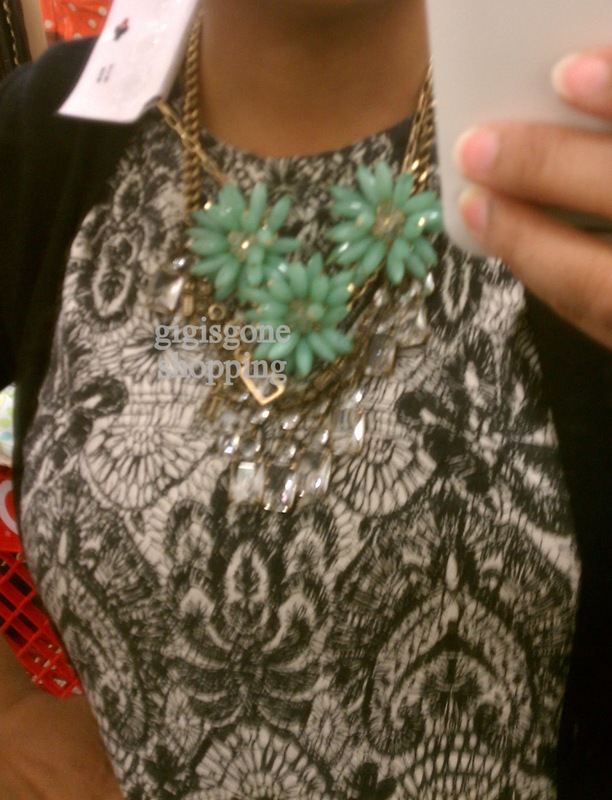 When I saw this beaded cream flower bib necklace ($16.99) at Target, I thought of the J Crew necklace. On the left, J Crew styling from their blog. 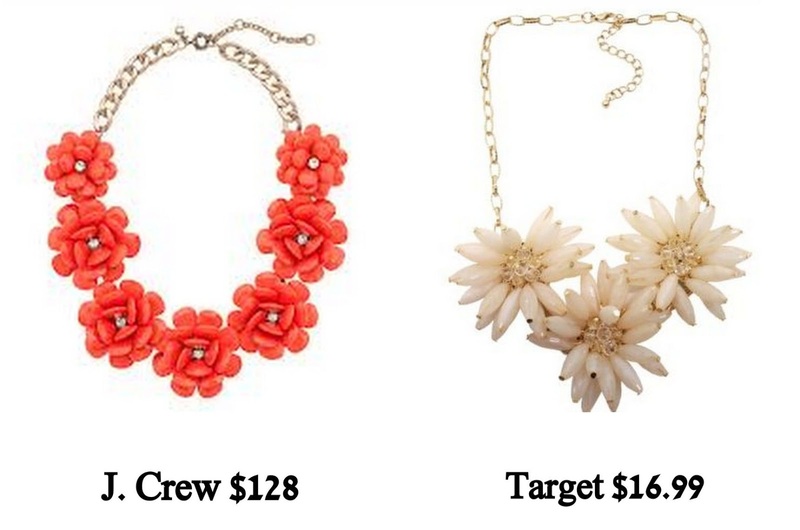 On the right, the same idea is accomplished w/the Target necklace and the Martha necklace ($165). I think the J Crew version is beautiful with the flowers spanning the length of the necklace. I would probably be self-conscious of the bright color & size of the flowers. I really like the Target version, not just because of the price. I admire, but don’t usually buy spiky things (I.e studs), but I liked the flowers on this one. Maybe they also remind me of a sunflower a bit, which is one of my favorites. Thumbs up. See a smaller scale, but still very pretty DIY version of the J Crew rose necklace on My Little Secrets. ETA: Thanks for sharing, Paula! Kohl’s Apt. 9 gold tone bead flower necklace ($24) – Kohl’s usually has promos going on in-store. Be sure to check their site for any printable coupons you an use on top of the promos. If you’re a cardholder, you’re in luck because they often have really good promos like the 30% off one Paula mentioned in the comments. If you go into the store & they don’t have it in stock, you can order it from a kiosk and you will get free shipping. ETA: Banana Republic pearly bloom necklace ($89.50) jumping into the ring for the smAcKdoWn. This is how I wanted the Target necklace to look. More flower blooms. I thought about getting a 2nd necklace and putting the two together, but I know I won’t do it. I’m fine w/the Target one as-is, 3 blooms. 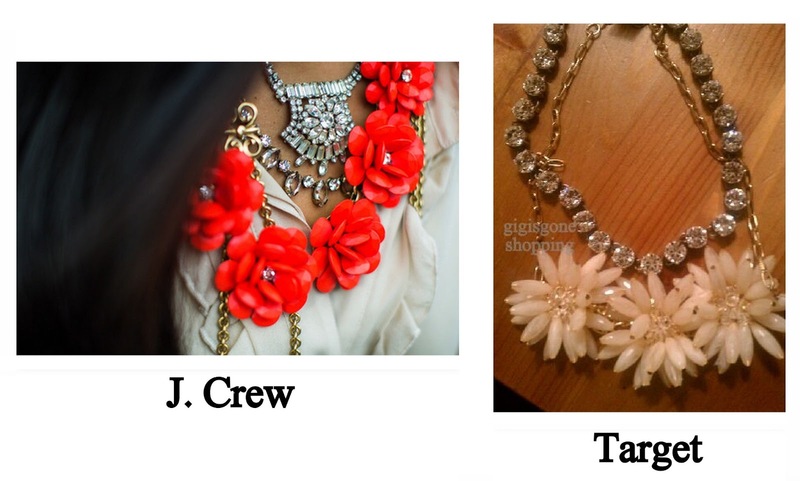 Would you rather find/hunt down/pay for the J Crew beaded rose necklace? Or is the Target version fine by you? I personally like the Target version. I know how I am with these things. I’ll wear them 5, 6, 7 times and be onto something else. The Target price is right. You could get both colors & still come out way ahead when compared to $128 for J Crew. Kohls has a bunch of coupons out right now, best one being SHOPNSAVE for 30% off with a Kohls charge. These versions are pretty, but I got "the feeling" the first time I saw the JC one, and get that feeling every time I see someone wearing it. But I know that I wouldn't reach for it in my real life :). So I admire it (a lot!) from afar. The Target one looks lovely on you Gigi, I like the color variation a lot! Paula – Thanks for sharing that great Kohl's find! I still haven't seen the JC necklace irl, so maybe I would be into it if I did. Crewlade! I still think the scale would be off for me, though. I regret not getting it,even though it is not the look i would weasr IRL. Check out Kate Spade's Field Day Statement Necklace, priced at $278. The Target necklace is a fantastic substitute! I saw this one too and think it's so cute! Love both colors. shopwithm – I hung out in the jewelry dept for awhile in Target. They were failing for awhile, but have stepped it up again. This target necklace is super cute! I also think I'm feeling the crewlade to really want the beaded rose necklace after seeing it on countless people on instagram. However, when I had actually seen it IRL in stores, I felt it was way too big for my style. I saw yesterday on instagram this j.crew knockoff (made in China too). It's kind of crazy how similiar this is the real J. Crew one. They can copy anything in China! http://www.etsy.com/listing/125676337/sale-clear-glass-gemstone-flower? Unknown – Another wow! I paid close to full price for mine. I would imagine that the J Crew necklace was made in China. And I'm convinced that some of these factories fill the company orders, then run some off to sell for themselves. I think in some cases the 'real' thing is selling for cheaper. And in some cases it's a knockoff. I just ordered the etsy version. I am excited to see how it looks when it comes! Did you end up buying the Target necklace in green? looks great on you! Unknown – Not sure if this is you above…lol I got the neutral color. I figured it would go with more. That green one looks great on you! I would not pay JC $ for such a trendy item. Jruby18 – So true. Do you remember the silk-ribbon chain-link necklace (2009)? I ended up getting one on sale, but I can't say I wore it more than 4x. I'm sure the same would happen w/the beaded rose, so I'm glad I found the Target floral necklace. The minty green looks delicious! It's funny, I did 'like' the Crew Beaded Rose when it first made its appearance online. Then I saw pics of it on women and it looked sorta large. But then I thought, hey, it's a statement piece–so maybe I'll pick it up on sale and with a discount applied. Then it happened, it sold out. And as we all know, that's when some of us fall head over heels in love, lol! So I called Crew and got added to the "We Will Find It For You" service, where Crew diligently scours the earth for 30 days until something shows up. I didn't have much hope, but yesterday the necklace was booked off of my cc, and I received an e-mail confirmation that the Beaded Rose Necklace is on its way. Such a saga, but I don't know why I do this, lol! Thank you Gigi for posting these awesome options, especially that mint beauty!!!! So true in regard to ebay–growing skepticism about some of the jewelry pieces. Unknown – Way to restrain 😉 Glad your store had it. I already wore mine today. It's a fun little piece. Great smackdown! I am one who was smitten with the JC original from the beginning, but decided to wait for a birthday gift card. It almost cost me the necklace entirely, and though I was lucky enough to catch it on pop back, I still have to wait until the end of March. The eBay Cabbage-Patch-Kid-esque scalping really fries me! kiwigem – I'll be posting irl pics of the beaded rose. Hopefully before you receive yours. I'm with you — until I get more wear out of my existing high price costume jewelry, I refuse to spend more than Target prices. Actually I like how the Target version looks. Great post. TC – Costume jewelry is rampantly available everywhere. Raina Cox mentioned that the markup is high, so it must be cheapie-cheap to produce for a high profit margin. I try to keep that in mind when looking at the higher priced costume goods. I picked up the Target version in both colors (couldn't decide!). Love. Thanks so much for drawing to my attention! L – I like my Target one, too. Visited the green one again — lol — but the peachy tan one is just fine. A belated THANKS for this post. I honestly did not love the J Crew version but I love the spiky plastic versions — I bought the pink one from Kohl's tonight! TC – I tried the beaded rose necklace last nite. Not for me. I'm glad I didn't do a hunt for it. I got the Kohls one in this week and I love!! Ordering another to give as a gift, plus its only $12.99, the flowers are nice and big and it seems like a quality piece..recommend!! Anon – What a nice gift! Thanks for sharing your thought on quality. so I went nuts and bought the beaded rose bec I saw on instagram that it was available in the chicago store. Gigi, what was your impression when you tried it on? It's kinda, well, big. I think I just got suckered into wanting it because everyone else did. you’re actually a excellent webmaster. The site loading speed is incredible. It sort of feels that you’re doing any distinctive trick. Also, The contents are masterpiece. you have done a fantastic task in this topic! I simply want to say I’m all new to blogging and really loved this web-site. Very likely I’m want to bookmark your website . You really come with exceptional writings. Many thanks for sharing with us your website. I simply want to tell you that I am new to weblog and honestly liked you’re blog site. More than likely I’m planning to bookmark your blog . You definitely have impressive posts. Thank you for revealing your website page. I simply want to tell you that I am just very new to blogging and site-building and seriously loved this web site. Almost certainly I’m going to bookmark your blog post . You certainly come with fantastic article content. Thanks a lot for sharing your blog site. I simply want to say I am newbie to blogs and really savored your web page. Most likely I’m planning to bookmark your site . You actually have wonderful well written articles. Many thanks for sharing your webpage. I just want to mention I am beginner to blogging and actually loved you’re page. Very likely I’m want to bookmark your website . You certainly come with incredible stories. With thanks for revealing your website. I simply want to mention I am just newbie to blogs and seriously liked this web-site. Most likely I’m planning to bookmark your blog post . You definitely have fantastic articles and reviews. Thank you for sharing your website. I simply want to mention I am just all new to weblog and really liked you’re page. Almost certainly I’m going to bookmark your website . You really have very good writings. Thanks a bunch for revealing your web-site. I just want to say I am all new to weblog and honestly savored you’re web page. Probably I’m planning to bookmark your website . You really come with remarkable posts. Regards for sharing your website. I simply want to tell you that I am beginner to blogs and absolutely liked this blog site. Almost certainly I’m going to bookmark your blog . You amazingly come with amazing stories. Thanks a lot for revealing your website page. Can I just say what a aid to search out somebody who truly is aware of what theyre talking about on the internet. You positively know learn how to bring a problem to gentle and make it important. Extra individuals must read this and understand this facet of the story. I cant consider youre not more popular because you definitely have the gift. I simply want to say I’m all new to blogs and certainly liked this web site. Very likely I’m want to bookmark your site . You amazingly come with superb well written articles. Regards for sharing with us your web site. I just want to mention I am just very new to weblog and really savored your web site. Almost certainly I’m going to bookmark your site . You definitely come with tremendous articles. Appreciate it for revealing your blog site. I have been browsing on-line greater than three hours these days, yet I by no means discovered any interesting article like yours. It is pretty price enough for me. In my opinion, if all site owners and bloggers made good content material as you did, the net will be much more useful than ever before. What i don’t understood is in reality how you’re no longer actually a lot more smartly-favored than you might be now. You’re very intelligent. You know therefore considerably on the subject of this topic, produced me in my opinion consider it from numerous numerous angles. Its like women and men don’t seem to be involved except it’s something to do with Woman gaga! Your personal stuffs nice. At all times deal with it up! Howdy! I just would like to offer you a big thumbs up for the great information you have right here on this post. I will be coming back to your web site for more soon. You can certainly see your enthusiasm within the paintings you write. The arena hopes for more passionate writers such as you who are not afraid to mention how they believe. Always go after your heart. I’ve recently started a web site, the info you provide on this website has helped me tremendously. Thank you for all of your time & work. “The word ‘genius’ isn’t applicable in football. A genius is a guy like Norman Einstein.” by Joe Theismann. This is the right site for anyone who would like to understand this topic. You understand so much its almost tough to argue with you (not that I actually will need to…HaHa). You certainly put a fresh spin on a topic which has been written about for many years. Great stuff, just great! There’s certainly a lot to learn about this topic. I like all of the points you made. You’re so awesome! I don’t suppose I’ve truly read a single thing like this before. So nice to discover someone with a few unique thoughts on this issue. Seriously.. thanks for starting this up. This web site is something that is required on the internet, someone with some originality! You are so cool! I do not believe I’ve read something like this before. So wonderful to discover another person with genuine thoughts on this issue. Really.. thank you for starting this up. This website is one thing that is required on the internet, someone with a bit of originality! Your style is so unique compared to other people I have read stuff from. Thank you for posting when you’ve got the opportunity, Guess I’ll just book mark this blog.